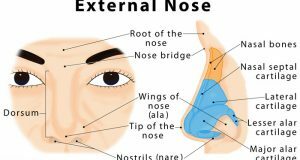 Nose is the fleshy protrusion located in the middle of the face that works as a principal part of the respiratory system, in addition to being the primary organ of smell . 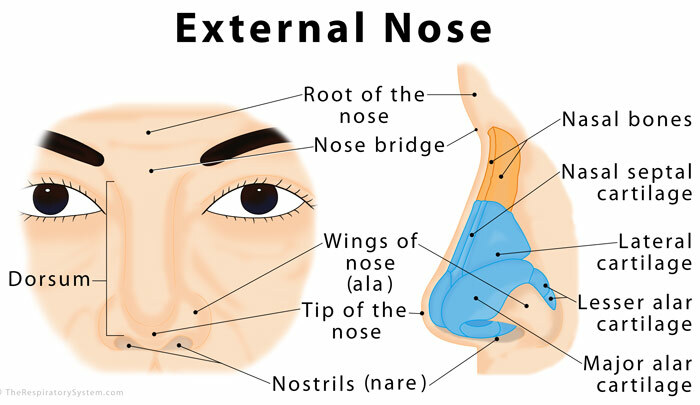 The human nose is composed of skin and other soft tissues, along with cartilages, and bones that extend from the skull . The external part of the nose has a triangular or pyramidal shape, with the highest point of it referred to as the apex or the tip of the nose . The thin superior part that blends with the forehead is called the root of the nose, while the region between the apex and the root is called the dorsum. The small curve just beneath the root is known as the nose bridge . Beneath the apex are the nostrils or nares, surrounded by the nasal septum and the cartilaginous ala nasi or wings of nose . 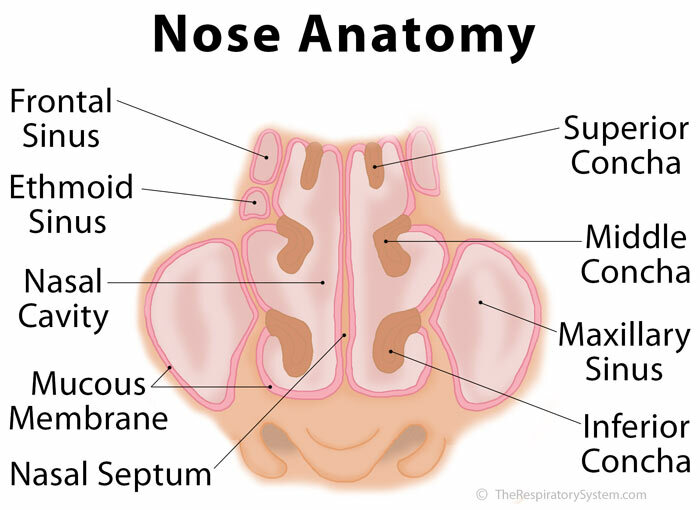 Nasal Vestibule: The area lying just behind the nasal cavities, the nasal vestibule is lined with skin tissue, unlike the rest of the nasal cavity. It is surrounded by the wings of the nose and the nasal septum, while its floor is formed of the hard palate . Respiratory Region: The wide space within the nose covered with cilia and mucus-secreting goblet cells . 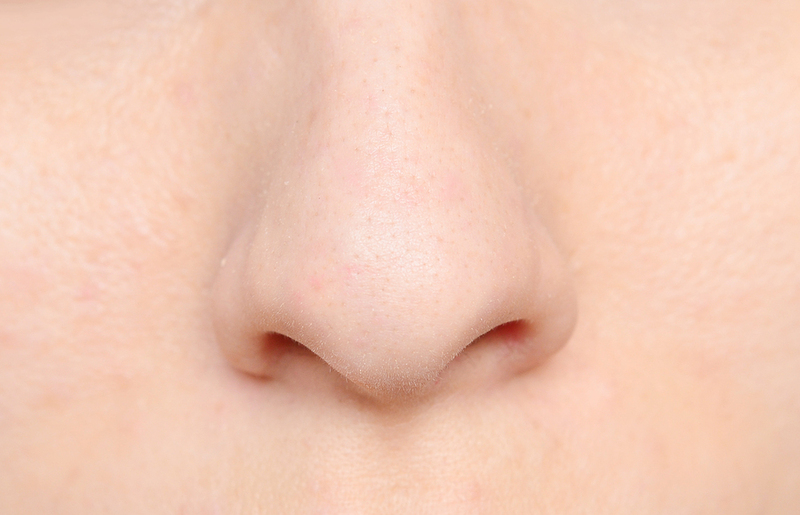 Olfactory Region: The highest point of the nasal cavity, the olfactory region contains the olfactory receptor neurons. Humans have around 5 to 6 million of these receptors (as opposed to dogs who have 220 million) . There are two such patches of olfactory receptors in each nasal cavity, located beneath the two olfactory bulbs, the region that connects the nose with olfactory (smelling region) of the brain . The nasal walls are formed of three paired and two unpaired bones; the paired ones are the nasal, palatine and maxillary bones, while the vomer and ethmoid bones are unpaired. Also, there are three pairs of nasal conchae (nasal turbinates) that protrudes spirally from the sides of the nasal cavity on both sides. The primary cartilages in the human nose include the lateral, septal, and the greater and lesser alar cartilages . The upper part of the human nose is quite hard and bony, with the nasal bones forming the nose bridge, while the sides of the upper external nose are supported by the frontal processes and medial plates of the maxilla . The flexible lower part is composed of the lateral, greater alar, and lesser alar cartilages along with the cartilaginous septum . The large lateral and major alar cartilages (two of each for the two sides of the nose) play the primary role in shaping up the nose . The number of the lesser alar cartilage often vary from person to person, usually ranging from three to four on each side . Nasal Septum: The front part of the septum is made of the septal cartilages while its posterior end joins with the front part of the ethmoid and vomer bones, as well as the perpendicular plate of the ethmoid bone . The Floor: The hard palate, located where the nose and mouth cavities come together, and keeping them separated from each other, forms the horizontal floor of the nasal cavity. The specific bones involved are the palatine process of the maxilla, and the horizontal plate of the palatine bone [7, 17]. The Roof: The relatively narrow roof is made us of the front-inferior part of the frontal bone, the two nasal bones, the cribriform plate of the ethmoid bone , as well as the sphenoid bone and ala of vomer . There are three pairs of nasal conchae: inferior, middle and superior nasal conchae. The inferior conchae are the largest among the three (almost as long as an index finger), while the superior conchae are the smallest. The middle conchae are about the size of a little finger . There is a common myth that the human nose never stops growing, even after one reaches adulthood. In truth, the nose does not actually keep growing, but its shape does alter a little as one ages. As the upper part of the external nose is supported by bones (nasal bones) there are no noticeable changes in its appearance. However, the cartilages supporting the lower part of the nose become weak with age, which makes the tip of the nose droop, making it appear flatter and wider . There are certain air-filled areas within the bones surrounding the nasal cavity. These empty spaces, having a respiratory mucosa lining on their inner walls , all center on the nasal cavity, and are called the paranasal sinuses . There are four paired paranasal sinuses in humans, named after the bones they are located in: maxillary, ethmoid, sphenoid, and frontal sinus . All draining into the nasal cavity, the sinus openings are found on its lateral walls and roof. There are some other openings in the nasal cavity, apart from the sinuses. The nasolacrimal duct that drains tears from your eyes also opens into the nasal cavity, into the inferior meatus beneath the inferior concha . So when you cry, some of the tears produced by your tear ducts drain into your nasal cavity where they mix with mucus, making your nose run . The nose has a rich blood supply provided by arterial branches from both the internal and external carotid . The former includes the posterior and anterior ethmoidal arteries , while the latter includes the sphenopalatine artery, greater palatine artery, superior labial artery, and angular artery . The superior labial artery, a branch of the facial artery, supplies the external nose region . The vascular supply of the dorsal and sellar (the area in the sphenoid bone housing the pituitary gland) regions come from the internal maxillary and ophthalmic arteries . The sphenopalatine artery, along with the anterior and posterior ethmoid arteries supplies the lateral wall of the nose. These arteries also bring up blood supply to the nasal septum and sidewalls , with additional sources of vascular supply including the greater palatine artery (posteriorly) and the superior labial artery (anteriorly) [25, 26]. Kiesselbach plexus: This refers to a small area in the lower anterior part of the nasal septum that marks the convergence point for all three of the primary internal nose blood supplies . This is the area where nosebleeds occur in over 90% of cases . The venous system of the nose follows the arteries, draining into the ophthalmic and facial veins as well as the pharyngeal and pterygoid plexuses . Special Sensory Innervation: This refers to the sense of smell controlled by the olfactory nerves (CN1). 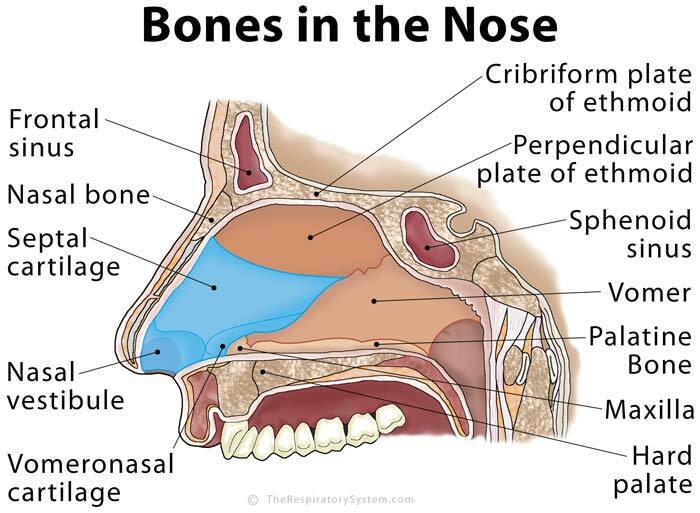 The olfactory sensory fibers run through the cribriform plate of the ethmoid bone  to connect to the olfactory bulb located superiorly to the nasal cavity . The neural receptors in this vein come in contact with any particles and chemicals entering the nose, and send them to the olfactory region of the brain to ‘smell’ . General Sensory Innervation: This refers to the general senses of the external nose and nasal cavity. The lateral walls of the nasal cavity and the septum are innervated by the maxillary nerve branch known as the nasopalatine nerve, and the ophthalmic nerve branch called the nasociliary nerve. The trigeminal nerve innervates the outer skin of the human nose . The nostrils are the entrance to the respiratory tract, meaning that during inhalation, air enters the body through the nostrils, and leaves in the same way during exhalation. Behind the nostrils, the two sides of the nasal cavity (divided by the septum) both open into a space called the choana, which then opens into the nasopharynx (the upper section of the pharynx or throat). Next, the air reaches the oropharynx, the region behind the mouth, lying just after the nasopharynx . This way the inhaled air travels down the larynx, trachea, and bronchi to reach the lungs. Cilia, or the hairs covering the inner walls of the nasal cavity, along with the mucus lining, purify the inhaled air by trapping any dust, pollen, and other harmful particles, preventing these from entering the inner parts of the body . The cilia also serve to get rid of these impurities as their sweeping back-to-front movement helps to carry the harmful particles toward the throat where they can be swallowed, or to the nasal cavity to be excreted . Another purpose for the nose hairs and mucus is to heat up and moisturize the air, so it matches the ideal air temperature and humidity within the lungs (98.6°F and 100%) . After the oxygen-carbon dioxide exchange within the lungs, the CO2-rich air travels up the airways, reaching the nasal cavities where the nasal hairs and mucus absorb the heat and moisture from the air before it leaves the body through the nostrils . The spiral nasal conchae bones play a vital role here, to keep the air whirling around for longer within the nasal cavity so it can be purified and humidified better . The human brain can distinguish between at least 1 trillion different smells , and the nose is the pathway for them to reach the smelling section of the brain . When the inhaled air comes in contact with the roof of the nasal cavity (olfactory epithelium), the nerve fibers extending from the olfactory receptors collect the odorant molecules to send them to the olfactory bulbs through the receptors. These nerve signals are then carried to the olfactory region in the brain to be decoded so the smell can be identified . The nose also plays a vital role in how you taste your foods. The taste buds on your tongue can only recognize if something is sweet, bitter, sour, or salty. So, for all the other sensations of taste and flavor, you rely on the smelling ability of your nose .